The Staff Senate would like to say, “Kudos” to all staff members who took the time to recognize and share their colleague’s accomplishments, sense of community, and dedication to excellence! 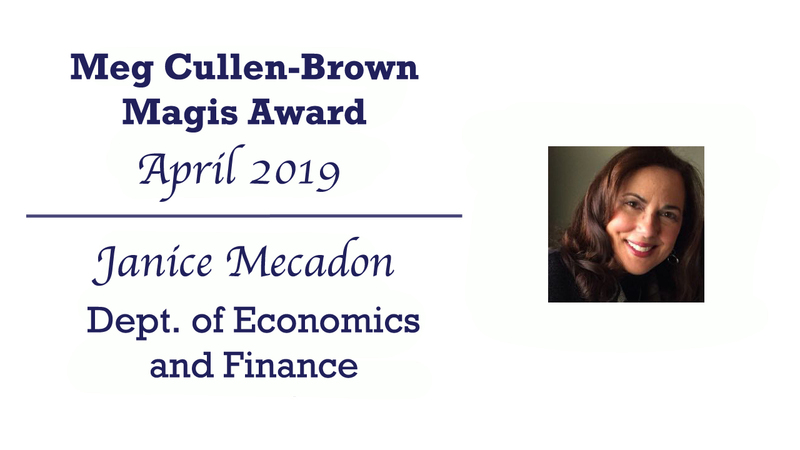 This month’s Meg Cullen Brown Magis Award nominations were overflowing, with a record number of 37* nominations! How long have you worked at the University? I am celebrating my 10th year! WooHoo!! Too many reasons to list but most of all I truly love working at The University of Scranton. Janice will receive a certificate for $50 worth of complimentary food at our fabulous University food service outlets, as well as, a reserved parking space for the month of their selection! Each monthly winner is also invited to the Senate Recognition luncheon in May to receive a certificate of appreciation. We congratulate our “winner” and all the other nominees for being recognized as “Magis” employees. We hope you will join the Staff Senate in recognizing and nominating employees in the future, and share our excitement for giving individuals the opportunity to be acknowledged for their outstanding efforts on behalf of our campus community. The nominations must be submitted by the 29th of the month for the next drawing to pick a winner. You can use this link to obtain a nomination card. Click here to view past recipients! The card may be completed online and forwarded to Peggy Doolittle at peggydoolittle@scranton.edu . You may also print it out and send it to Peggy’s office in 401 Louis Brown Hall. In addition, Nomination Cards will be available to Facilities Operations and University Police personnel through their supervisory chains of command.